Orders are despatched on a Wednesday, Thursday or Friday only. We no longer despatch orders on a Monday or Tuesday. - Orders placed on a Friday, Monday and Tuesday will be processed and despatched on a Wednesday. - Orders placed on a Tuesday, Wednesday and Thursday will be processed and despatched the next working day. At the checkout, you will be able to schedule a despatch date on any working Wednesday, Thursday and Friday in the future. This helps preserve the shelf life, which can be important for the shorter shelf life cakes. On the day of despatch, we take the cakes for your order from frozen stock. They are completely safe to refreeze on receipt for up to 3 months if you wish. All our cakes are suitable for home freezing. The cakes are not individually date stamped but details on shelf life and refreezing are included with your order. UK orders are sent by 1-2 day courier for a week day (7am to 7pm) delivery. They do not deliver on a Saturday, Sunday or Bank Holiday. We cannot guarantee particular delivery days. Deliveries to Scotland might take an extra day. All orders will require a signature on receipt. If you will be out and would like your parcel left in a safe place or delivered to a neighbour, please leave details in the 'Order notes' section at the checkout. Alternatively, at the checkout you can select delivery to a different address. If you require more information, please contact us on tel: 01963 23644 or shop@honeybuns.co.uk. 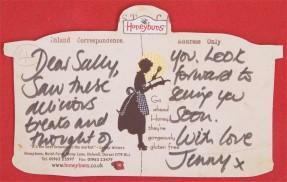 For further details see our Online Terms and Conditions or call us on +44 1963 23644 or email shop@honeybuns.co.uk. Customer delight is our aim. We offer a no quibble guarantee, so if you are not entirely happy with anything then please do contact us and we will arrange for your order to be returned, replaced or refunded. We want all our orders to arrive safely. 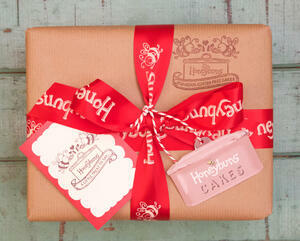 We send all orders in Honeybuns branded postal bags or boxes. If you want to keep your gift a surprise then you are able to choose an alternative delivery address at the checkout, or if that's not suitable then please add a note when ordering that you would like your gift without any Honeybuns branding on the outer packaging. We do not include invoices with any orders. Our charming gift wrap will make any present that extra bit special; Honeybuns bespoke luxury red ribbon and mini Cake Tin gift tag, kraft paper wrap, and gift card where we'll write your personal message, and why not add one of our special gift stamps to the wrapping. You can add gift wrap when you checkout. Or include a Cake Tin postcard (shown right) with your own gift message and gift stamp at no extra charge when you checkout. On the day of despatch, we take the cakes for your order from frozen stock. They are completely safe to refreeze on receipt for up to 3 months if you wish. Further details on shelf life and refreezing are included with your order. All our cakes are suitable for home freezing. For shelf life and allergen information, take a look here. Find all our Vegan FAQ's here, including which products are vegan, which ones are registered with the Vegan Society, and why some products state they're vegan but say 'may contain traces of milk'.